KVAC A rivals have had their fair share of ties over the years. PARIS — Following an exciting double overtime, Mt. Blue field hockey coach Jody Harmon and her Oxford Hills counterpart, Cynthia Goddard, pretty much said the same thing: What else is new? These coaches have been down this road before. Overtime games between the Mt. Blue (4-1-1) and Oxford Hills (3-3-1) have become the norm over the years — and Tuesday’s 2-2 draw was no different. “Every time we play them, every year, at least one overtime,” Harmon said. “We had a ridiculous amount of opportunities and we just couldn’t finish them. “So many chances and the goal in the first half we were all just standing there. It’s like, ‘Oh, this game started.’ We were just watching. So we keep coming out flat and that ends up biting us in the end, and we can’t do that. The teams’ goalies were under siege for most the game, and Mt. Blue keeper Brooke Bolduc made 13 saves, while Madison Day stopped 11 for the Vikings. “My goalie (Brooke), she just had some great saves at the end there,” Harmon said. After regulation came 16 non-stop minutes of overtime action, during which each team nearly pulled off a victory. “We have been playing for a long time and it is kind of always a battle right down to the end,” Goddard said. “I thought Mt. Blue for a while kind of dominated that whole first half of it. We kind of hung in there, kind of hung in there and took advantage of our opportunities when we did. Both teams had chances to pull ahead in regulation, but each half ended in a tie. The Cougars dominated most of the first half even though the Vikings got on the board at the 28:50 mark. 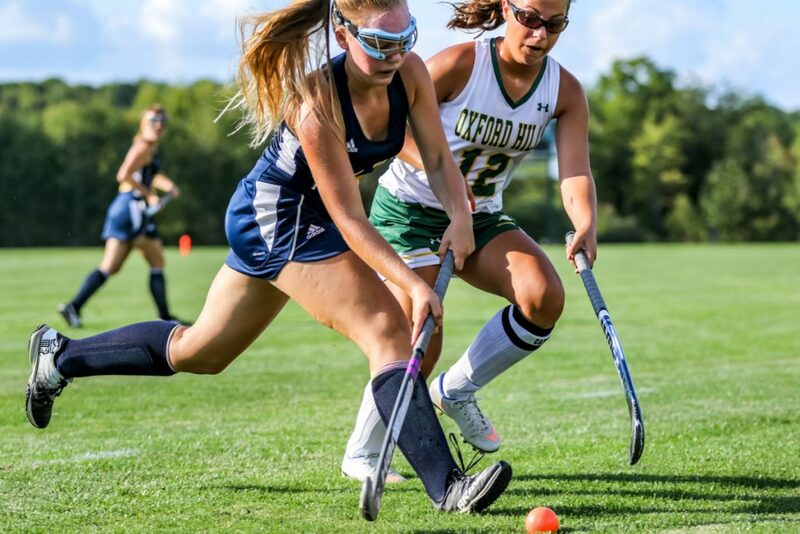 Junior forward Jade Smedberg punched in her unassisted goal to give Oxford Hills a 1-0 lead. Mt. Blue punched back with a goal when sophomore Keegan Andrews used an Ashley Parlin assist to tie the game at 17:52. The Vikings again took the lead in the second half. Junior forward Brooke Carson scored on a feed from junior midfielder Lauren Merrill at the 18:16 mark. Nearly five minutes later, Mt. Blue countered again and tied it up on Ella Stone’s goal, with the assist going to Rylee Keaten. The next 16 minutes featured some stunning saves from both goalies, including an eye-opener when Bolduc when she came out of the net to stop Smedberg on a breakaway. Both defenses were beginning to wilt in the hot sun as time slipped away in a hard-fought game that ended in a draw.